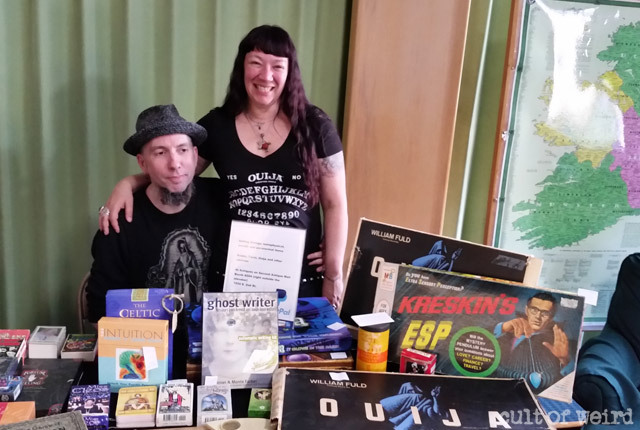 Curious crowds came in droves to the inaugural Milwaukee Paranormal Conference for a day of ghosts, monsters, UFOs and weird Wisconsin legends. 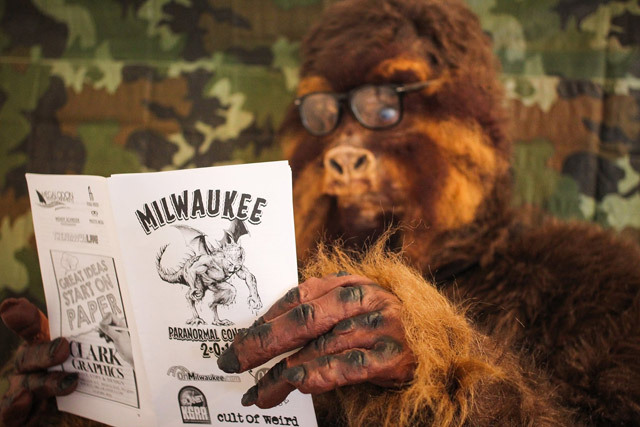 Sasquatch decides which speaker to catch next at the Milwaukee Paranormal Conference. 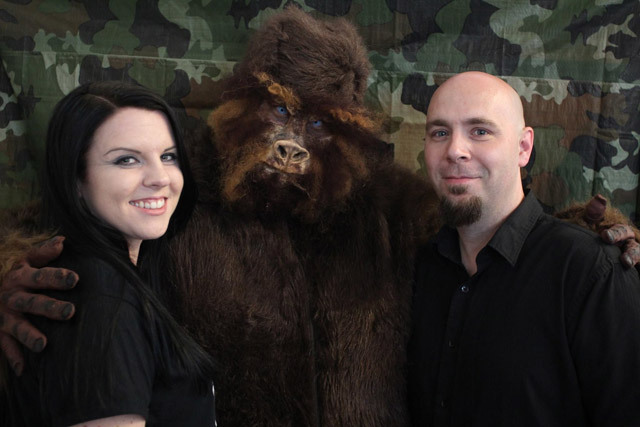 Where can you go to have an encounter with Bigfoot in the women’s bathroom? The Milwaukee Paranormal Conference, apparently. I mean, I wasn’t in the women’s bathroom personally, but second-hand accounts and blurry photos were evidence enough for me. 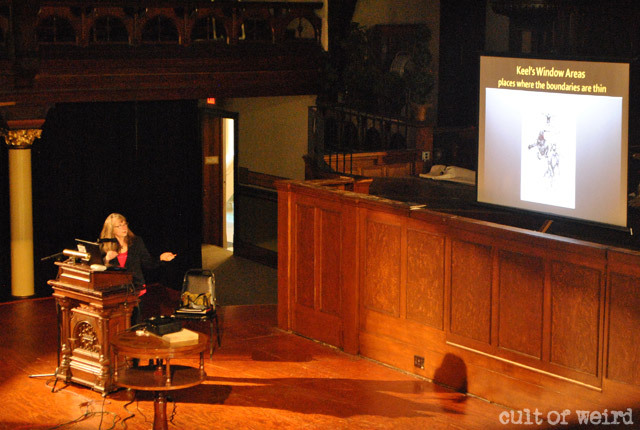 The conference was held Saturday, June 6th at the Irish Cultural & Heritage Center, which happens to be a deconsecrated church built in the late 1800s, complete with pews, stained glass windows and a massive pipe organ looming behind the stage in the main hall. According to the website, where the church stands now was originally part of the “Old Cemetery” Catholic burial ground prior to 1886. 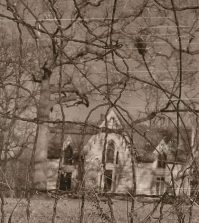 Where did the dead go when the church was built? Maybe they’re still there and caught some of the presentations. I should note that, despite being held in an old church, no one was struck dead, burst into flames, etc. As far as I know. 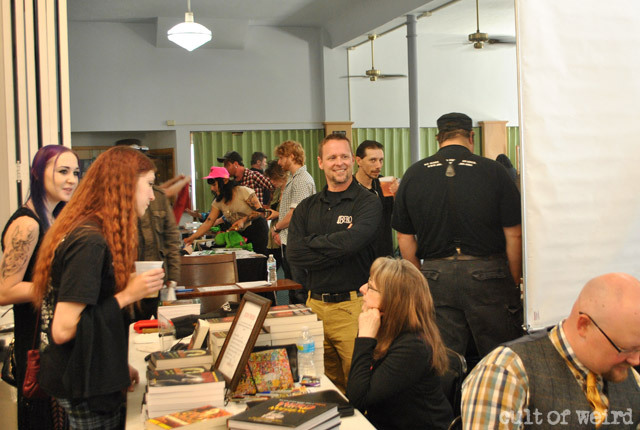 Milwaukee Paranormal Conference vendor hall. 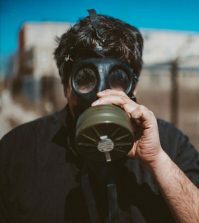 The conference was conceived by Milwaukee journalist Tea Krulos, who wanted envisioned a celebration of the paranormal to coincide with the launch of his new book Monster Hunters. 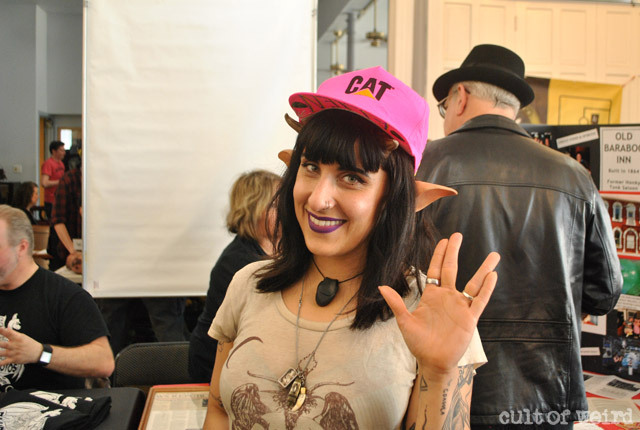 An estimated 900 attendees was astounding proof that the weird is alive and well in Brew City. I’m not sure what is going on here, but it’s awesome. Thanks to the support and ingenuity of my partners in crime Rob (Mad Taxidermist) and Christina (Slasher Betty) we were able to scrape together a pretty decent Cult of Weird table. Although at least a few passersby seemed to think we were recruiting for an actual cult of some kind. I suppose the skulls and occult symbolism may have had something to do with that. 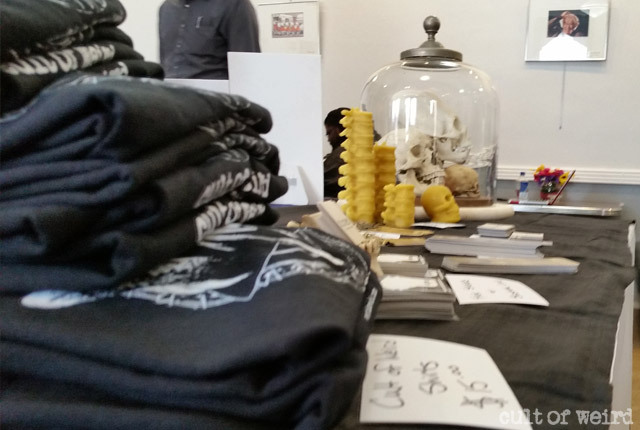 The Cult of Weird table in the vendor hall featuring Cult swag as well as the Mad Taxidermist’s new hand-made beeswax spine candles. The Mad Taxidermist brought some skulls along. Rob and Christina man the Cult of Weird table. When I wasn’t at our table fighting off a paralyzing social anxiety with Rob (while Christina did all the talking) I managed to catch a few of the presentations. 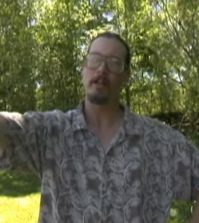 Wisconsin MUFON investigator Mark O’Connell discussed some of the unusual and often quirky UFO sightings in the state. Did you know that in 1961, aliens served a man pancakes from their flying saucer? 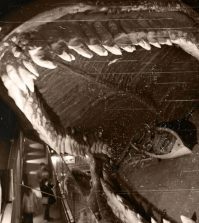 Linda S. Godfrey, author of Weird Wisconsin and The Beast of Bray Road, revealed some of the cryptozoological oddities seen in the state as detailed in her most recent book American Monsters. 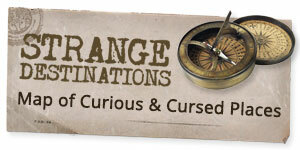 Linda S. Godfrey discussing strange creatures seen around the state. 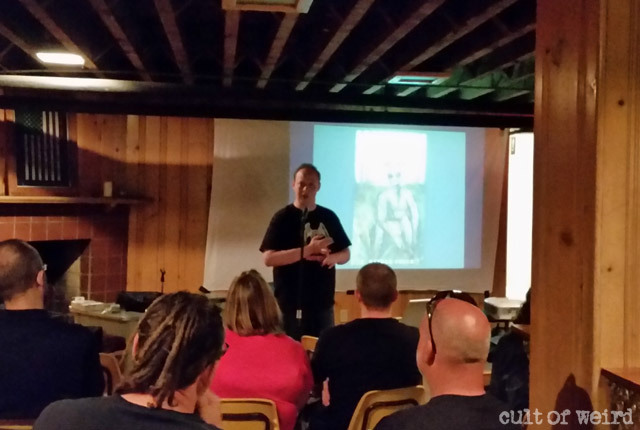 And, of course, I wouldn’t miss Cult contributor J. Nathan Couch’s presentation on the more paranormal elements of the goatman legends in Wisconsin and across the US. J. Nathan Couch talks goatman legends to a riveted crowd in the lower Pub. 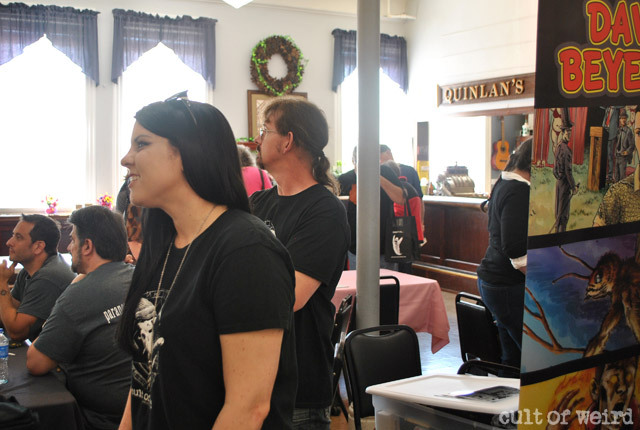 There were many other great speakers who I didn’t have the opportunity to see, including Allison Jornlin of Milwaukee Ghosts Tours & Investigations, Bigfoot researcher Jim Sherman, and Roswell expert Donald R. Schmitt, whose table happened to be right by ours and I didn’t even realize it, damn it. Tea Krulos hosts the Best Evidence Ever! 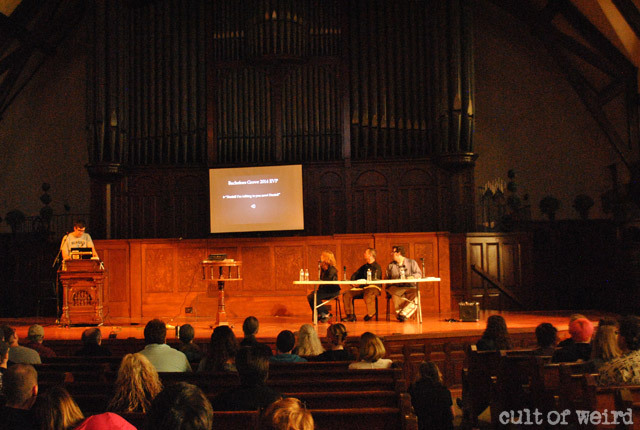 panel with Allison Jornlin, Jim Sherman, and Nicholas Roesler at Milwaukee Paranormal Conference 2015. We had the honor of being (very) near illustrator David Beyer, Jr. and his amazing work, Alex Groh of Muddy Waters Press (he had a furry trout poster), The guys from Blurry Photos podcast, the Brew City Paranormal crew, and Mike Hoke of The Strange Side with Mike and Nate and Cedarburg Ghost Tours. 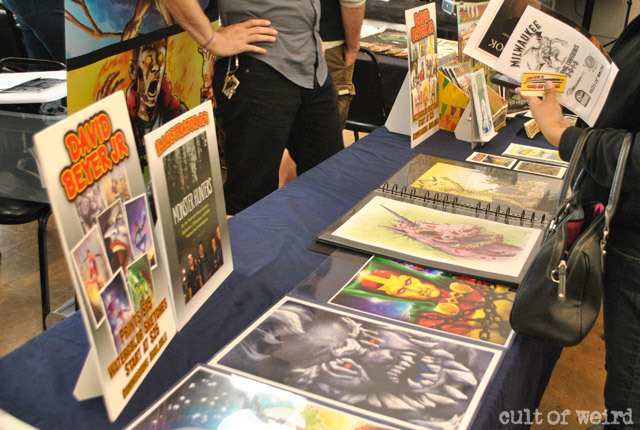 The artwork of illustrator David Beyer, Jr. 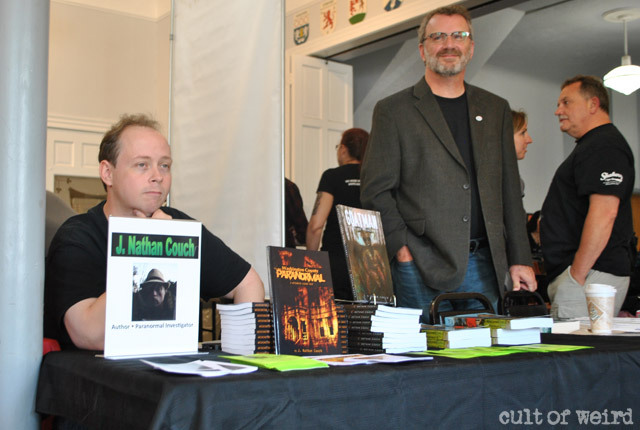 Author J. Nathan Couch (Goatman: Flesh or Folklore?) and Mark O’Connell, MUFON Chief Investigator for Wisconsin. Yep, we found Bigfoot. Mystery solved. Thank you to everyone who stopped to say hi! It was great to meet some local Cult of Weird readers who are passionate, curious, and, most of all, helping to keep the world weird. 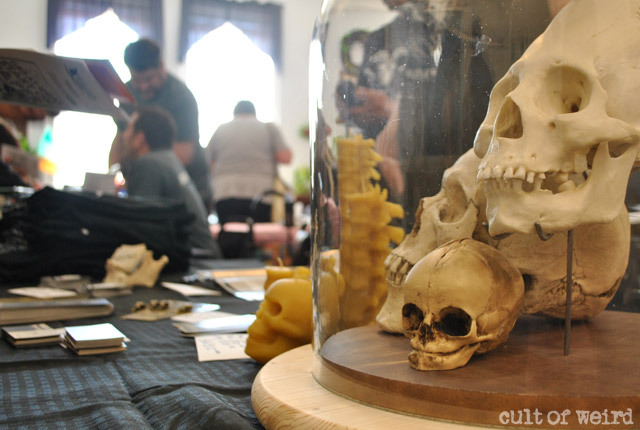 Also, our eternal gratitude to Tea Krulos for putting the event together and bringing Cult of Weird on board. Can’t wait to do it again next year!